Obituary for Martha Jane Crowther | W. J. Dooley Funeral Service Ltd.
We have lost a wonderful mother, grandmother, great-grandmother and great great-grandmother, Martha Jane Crowther, 100, formerly of Peppett Street, North Sydney, who passed away peacefully in her sleep, on Friday, March 15, 2019, at the Northside Community Guest Home where she resided for the past four years. 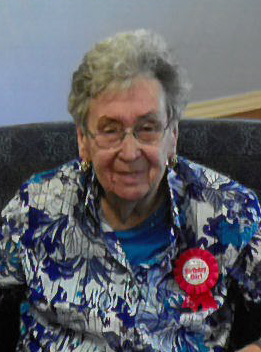 She was born June 19, 1918 in Margaree, NL, a daughter of the late George and Sarah Ingram. Martha was a stay at home Mom and loved being with her family, especially her grandkids, whom she had a place in her heart for everyone. We will miss her dearly. Martha is survived by her sons, Calvin and David, North Sydney, Gary (Marie) Sydney Mines, Dave Jr., Halifax; daughters, Anne (Winston McHardy), Saint John, NB, Debbie (Dave Marshall), Sydney River, Wendy (Jeff Barnes), Florida. Also, by her grandchildren, Tracey and Craig, Allan and Brittany, Alana and Steven, Quentin, Dave and Lynne; twelve great grandchildren, two great great-grandchildren and many nieces and nephews. She was predeceased by her husband Wilson, a son Donald, a sister, three step-sisters and a step-brother. The family would like to thank everyone at the Northside Community Guest Home for the wonderful care they gave our mother over the years and special thanks to Homecare worker Marie Forrest for many years of care. Visitation will take place 2-4 and 7-9 p.m. Tuesday, March 19th in the W.J. Dooley Funeral Home, 107 Pleasant St., North Sydney. A funeral service will be held 2:00 p.m. Wednesday, March 20th from the funeral home chapel with Rev. Jackie Warren officiating. Burial will take place at a later date in Lakeside Cemetery. Memorial donations may be made to the Northside Community Guest Home.